A fundamental foundation of individual and organizational development is a broad, data-based understanding of how individuals are currently performing. Yet, rarely do individuals receive specific, job-related feedback from which they can both learn and develop. In our work with individuals and organizations, we view feedback as a gift. Learning how we are perceived by others and, in turn, increasing self-awareness and coming to appreciate our blind spots, is the base upon which change can occur. The 360º Feedback Survey provides perspective on how others around us experience us in the work environment. It is often said that perception is reality for those around us. In other words, while we may see ourselves as a first class manager or leader, others may have a different perspective. 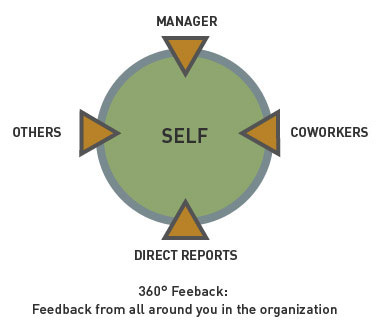 The 360º Feedback Survey aids individuals, managers, and executives in their understanding of how the universe around them (e.g., boss, peers, subordinates, customers) perceive them along a broad spectrum of on-the-job behaviors. Our 360º Feedback Survey instrument is based on a leadership model developed from extensive observation and research on key leadership behaviors, and the outcomes of those behaviors. The resulting model includes those skills, abilities, aptitudes, and traits we believe anyone in a leadership role needs to possess, grouped into 14 categories including: Coaching and Mentoring, Teambuilding Skills, Communication Skills, Interpersonal Skills, Work Habits, Organizational Savvy, General Business Acumen, and others. Click here to see a sample 360º Feedback Survey report.